Who doesn't love Mo Willems? That's rhetorical. Everyone should love him! I found out about one of his new books at a Judy Freeman workshop in the spring and LOVED it! I could NOT wait to share it at one of our programs! 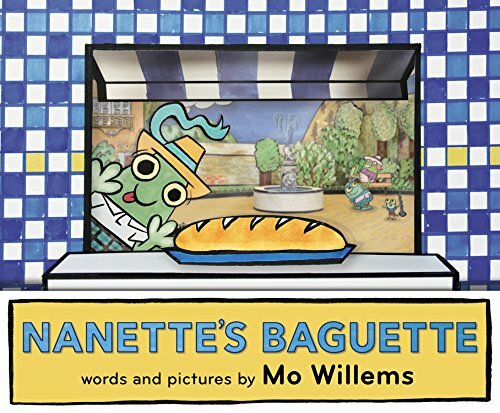 The Mo Willem's book that we read was "Nanette's Baguette". It is brilliantly wonderful (like most of his books)! And now I know 50 different words that rhyme with the word baguette! 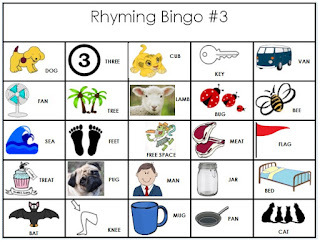 Rhyming can be a little tricky with a wide age group. The younger kids are just beginning to be introduced to the concept of rhyming words but our older kids are pros at rhyming already. I had the kids help me define what rhyming words are -- words that end with the same sound -- and give me some examples. Then I used three different word endings to fill in the blanks to create the rhyme words. We used words that end in "__ig", "__ake", and "__og". I showed pictures of items in that rhyming word family like a dog or a frog, and we filled in the blank as a group of the missing letters. For rhyming BINGO the kids played a BINGO game where they had to find the items on the BINGO card that rhyme with the word I called out. I made 8 different rhyming BINGO cards, with the idea that some kids can work together in groups as BINGO teams. The BINGO cards had 25 spaces on them. The free space was a picture of Nanette eating a baguette. 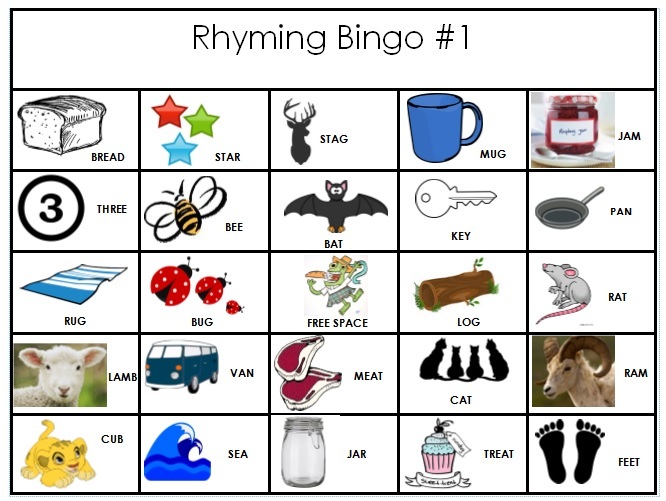 Since we had 11 rhyme families featured, many rhyme families had multiple ones on each BINGO sheet. The first time playing the game, I asked the kids to find all the words that rhyme on their board with the word I called out. And we shared them together as a group. I wanted it to be challenging for the older kids but not impossible for the younger ones. 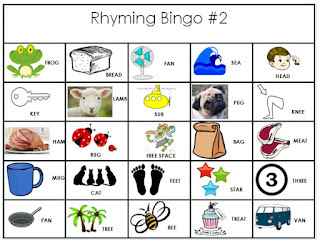 We played several rounds and kept working on the different rhyming words each round, mixing up which ones I called out. We did a simple craft this week. 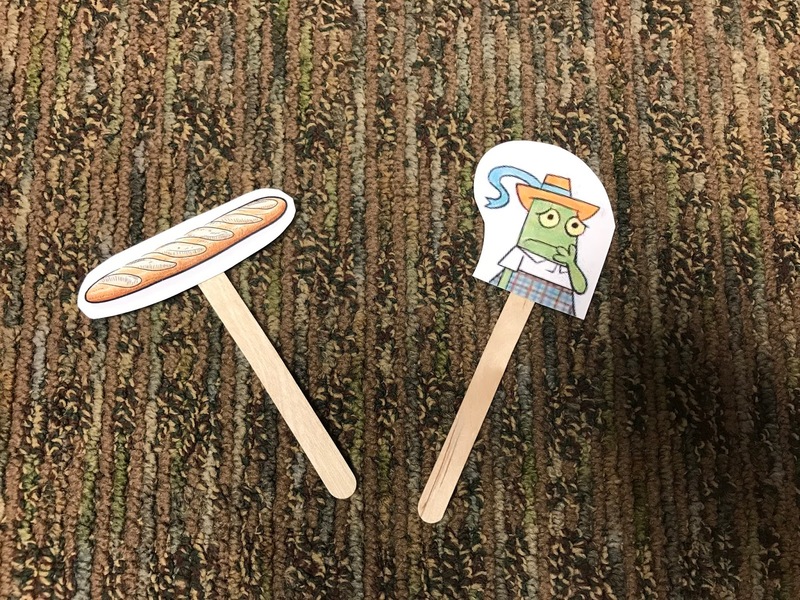 I had small cut-outs of the character Nanette and clip-art baguette's. 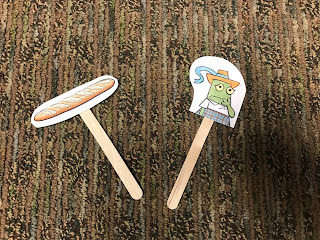 I had the kids use glue dots to attach their Nanette's and baguette's to a pair of Popsicle sticks. The kids could use these to tell their own version of the "Nanette's Baguette" story. 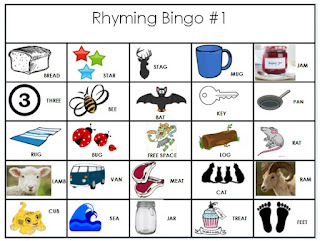 I also had the option, if the kids were done playing BINGO and there was plenty of time left at the end of the program, that we could act out the story with our Nanette's and do a reader's theatre-esque activity. I wasn't sure how the reader's theatre activity would go, or if any of the kids would be interested in using their Nanette's on Popsicle sticks. But all the kids LOVED them. One of my more serious regulars, who rarely engages with me, went out of his way to come up to me at the end of the program and tell me his version of "Nanette's Baguette". That was huge! Overall the program was a hit and I was so excited to share one of my favorite Mo Willem's books! I am a Children's Librarian in North Carolina. Every day is an adventure and an exciting opportunity to be an "Instiller of Wonder" in the hearts and minds of little ones.